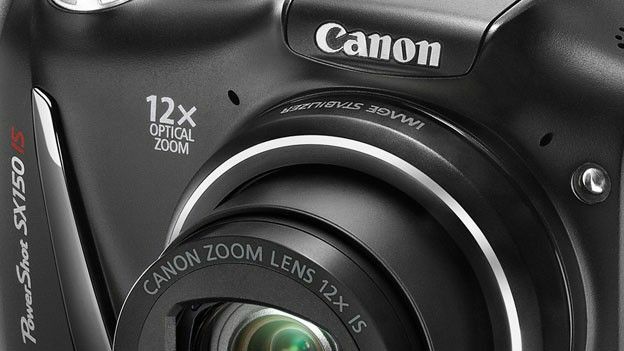 The Canon Powershot SX150 is the brand's latest digital compact camera, but does it do enough to take on its rivals? The Canon Powershot SX150 is good digital compact camera for beginners looking to take their first snaps to the next level as it offers more manual options than your run-of-the-mill compact including a hefty 12x zoom and a 14 megapixel sensor. The sibling Canon Ixus 230 set a high standard for the brand's compact cameras when we tested it and the SX150 also finds itself going to head to head with the likes of the FujiFilm FinePix F600 EXR but does it have what it takes t make it onto our list of the best digital cameras around? Canon's usual click wheel navigates you through the manual modes, with easy shortcuts to ISO adjustment, flash and several creative filters. The three-inch LCD is fine for framing, but a bit low-res for viewing back shots. A nice addition is the dedicated video button, which gets you filming 720p movies in a flash. The Canon Powershot SX150 is not a sharp shooter. You will notice some lag after taking shots and autofocus is a bit tardy. If you're hoping to catch fast-moving action the 0.6 shot per second continuous mode probably isn't your best choice. Rare now for a compact camera, the Powershot SX150 requires regular AA batteries. Not only does it add bulk to the overall feel of the camera, but with regular AAs you'll have to reload after just 110 shots. Serious shutter junkies will need to invest in rechargeable batteries. In favourable lighting conditions the SX150 performs exceedingly well, delivering bright, sharp colours. The auto mode can be trusted to produce passable shots, but play around with the settings and the SX150 can deliver something truly special. The image stabiliser works very hard to keep noise at bay, but at maximum zoom it does creep in – seeing as the zoom's a very sizeable 12x, that's not too surprising. That said, the zoom is very impressive for a camera of this size and price point. Night time is a different story, however. The SX150 copes poorly in low lighting conditions, with noise making a regular appearance and colours appearing washed out. There is a pop-up flash on hand to help matters. The Canon SX150 is a decent, solid camera and it won't cost you the Earth, unlike the rather more pricey Fujifilm X10. The added manual options and slick zoom have all the appearance of a DSLR, but the performance is far from DSLR standard. Also, with top-notch compact camerass, packing the ability to experiment with settings, now available for not that much more money, the SX150's bulk makes it seem less of a wise investment.